Pearls can bring you much more worth than its beauty, especially when you can sell them for over $3 million dollars. According to numerous sources including Diamonds.net and Forbes.com, on April 28th, Doyle New York Auction House claims to have set a record for the most spent on a rare pair of natural pearls when they sold a set of pearl earrings at their “Auction of Important Jewelry” for a staggering $3,301,000. The earrings beat out the previous auctioned pearls including, Sotheby’s Geneva who sold a pair of natural pearls from the collection of Gina Lollobrigida for $2.4 million in 2013, as well as Christie’s New York sale of the collection of Elizabeth Taylor in 2011 which sold for $1.99 million. In your mind you have to be pondering, what made these earrings so special? You will understand when you hear the details. 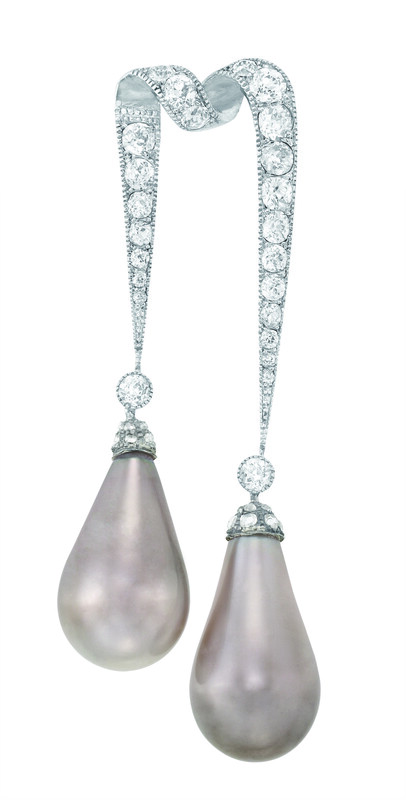 “The drop-shaped pearls sold to an anonymous bidder and measured approximately 9/10 inch in height and 1/2 inch in width, and were of a warm grayish color, mounted with antique silver and diamond caps, which were set onto a circa 1920 platinum and diamond pendant. The pearls were accompanied by a hand-written note referring to the pearls as having belonged to Empress Eugenie of France. In 1887, following the fall of Napoleon III and his wife, Empress Eugenie, an historic auction of the French Crown Jewels took place in the Louvre, lasting 12 days. The pearls were first purchased by George Crocker (1856 to 1909), the son of Charles Crocker, who founded the Central Pacific Railroad in California and were later owned by the descendants of Henry Huttleston Rogers (1840 to 1909) of Massachusetts, an industrialist who made a fortune as a partner with John D. Rockefeller in Standard Oil and a founder of the Virginia Railroad. The very wealthy, telephone bidder has decided to remain anonymous. What do you think—do you think it was a good purchase? Do you have a new look at pearls? This entry was posted in PearlsOnly Blog and tagged “Auction of Important Jewelry”, auction, Doyle New York Auction House, Empress Eugenie of France, expensive, millions, most expensive pearls, Natural Pearl Earrings Sell for Over $3 Million Dollars at Doyle New York Auction House, pearl earrings, Pearl Fashion, Pearls by PearlsOnly Team. Bookmark the permalink.